Oh boy, if only I had an adorable, allergy-friendly cupcake kit 12 years ago! Rewind to Jamie having no clue how to make her baby his first allergy-friendly birthday cake. Devastating! And I know many of you feel the same way, at first, as allergy moms. Yes, I eventually figured out how to make homemade milk-free and egg-free cake. It’s been our top blog post here at Milk Allergy Mom for a decade. But seriously, mine are never this cute! I’m lacking in the whole decorating department. 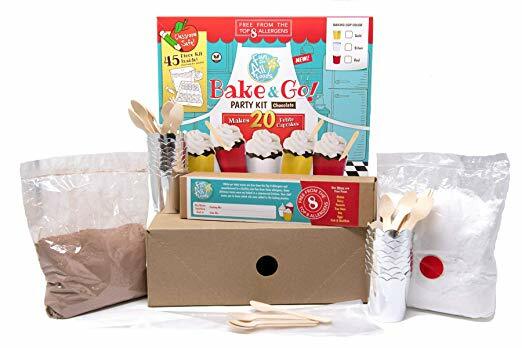 Duo and Party Cupcake Kits by Fun For All Foods are Top-8 Allergy-Free, as well. That’s something I KNOW I couldn’t pull off from scratch very well. Let me tell you, the miracle? They taste normal, guys! My non-allergy kiddo thinks they are the best, and that’s saying a lot for a kiddo who isn’t gluten-free. You can order a dual pack of regular size cupcakes or a party pack of 20 smaller cupcakes.